Book Cover: Vaisesika Dasa is the author of Our Family Business. 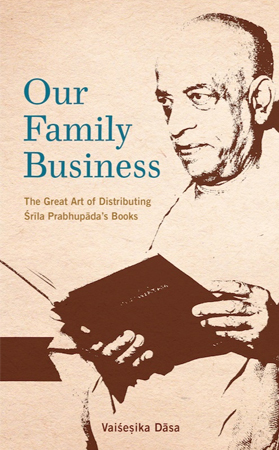 Welcome To Our Wiki This wiki is a supplement to the book "Our Family Business - The Great Art of Distributing Srila Prabhupada's Books" by Vaisesika Dasa. Please join in! Add your memories of distributing Srila Prabhupada’s Books, your realizations about this service, or your favorite excerpts from Srila Prabhupada’s purports and from scripture about the paramount importance of distributing transcendental literature. To begin this great collaborative journey you will first need to create an account here. Once you have created your account you may login at the top right corner or login here. What if you could build your devotee community, deepen your Krishna consciousness, give others the opportunity to learn about bhakti, and perform the dharma of the age all at the same time? In this very readable book, Vaisesika Dasa discusses both why we should join the family business of distributing transcendental knowledge through the written word as well as how book distribution benefits distributors, the devotional community, and all those who receive one of Srila Prabhupada’s books. The history of book distribution in ISKCON. How book distribution is “literary kirtana” and perfectly links one to the yuga-dharma. How performing book distribution is high sadhana and instills a taste for hearing and chanting. The Four Laws of Book Distribution – proven principles guaranteed to improve and increase your book distribution. Fun and practical ways to involve your whole community in sankirtana. Vaisesika Dasa was born in 1956. As a teen, he was an avid spiritual seeker. Soon after receiving a Back to Godhead magazine from a friend in the spring of 1973, he moved into the ISKCON temple in San Francisco at the age of sixteen and, with the blessings of his parents, became a disciple of Srila Prabhupada and a full-time monk dedicated to the practice of Krishna bhakti. Today he lives in the San Francisco Bay Area with his wife, Nirakula Devi Dasi, also a disciple of Srila Prabhupada. Together they have developed an ISKCON community of three hundred families in Silicon Valley, which is based on the study and distribution of Srila Prabhupada’s books. He is an initiating guru in ISKCON. He travels widely to teach the tenets of devotional service and the great art of distributing Srila Prabhupada’s books. This page was last modified on 21 February 2016, at 16:05.